Taxes are responsible for less than half of total revenue. Social Services and Income Maintenance (SI) is a spending category with many items on its plate. The first, public welfare, gobbles up 69 percent of the spending on average; spending on hospitals comes second with 20 percent, with health in third at ten percent. The two remaining categories are Employment Security Administration (0.4 percent) and Veterans' Services (0.1). The states vary in how they distribute their SI spending, but most states put the bulk of their outlays on welfare programs. In 34 states, welfare accounts for two thirds of SI spending; in 47 states it is responsible for more than half of the total SI budget. There is an important point in these numbers. It is not the case that the public welfare programs provide relief for the poor; most of the spending is actually directed toward people with jobs. The American welfare state is not designed as a poverty-relief system, but purposely constructed to redistribute income from higher income earners to people with lower incomes. As a result, SI continues to grow when the economy does better - quite the contrary to what many people expect. In other words, expect an even stronger focus on SI spending over time. On average, hospital spending is the second largest item under SI, with $1.90 being spent on hospitals for every $1.00 spent on health care. In 38 states, hospital spending exceeds health care spending, with Wyoming at the top. The Cowboy State is the only one where a majority of SI spending, 50.8 percent to be exact, goes to hospitals. This does not mean that Wyoming is particularly stingy with either health care spending in general or public welfare; it is the result of a creeping government takeover of the hospital sector in Wyoming. Health care spending, in turn, is primarily the state contributions toward Medicaid. Vermont tops the league with 18.1 percent of SI spending going toward providing health care for enrollees in state-funded health insurance. Michigan is second (16.8) followed by North Carolina (16.5), Delaware (16.0) and Arizona (15.9). On the education side, on average 64 percent of state and local government education spending is for K-12 spending. Of that money, in turn, 9.3 percent is for capital outlays, in other words school construction. Here again, Wyoming stands out, spending 22.5 percent of its state-and-local K-12 budget on school construction. North Dakota is a close second at 22 percent: the state that comes closest is Kansas at 17.1 percent. Over time, state and local governments have become more dependent on federal funds. We will look at trends later; for now, let us note that federal funds on average pay for one fifth of state and local government spending. 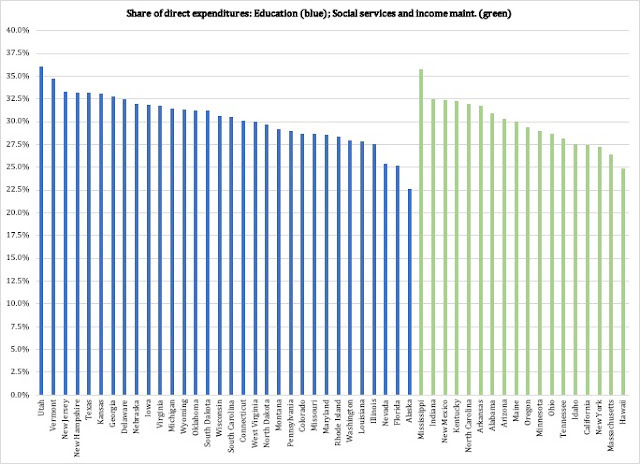 The share is considerably higher for the states alone, as they receive almost all of the federal funds. That said, the share has gone down since the early years under Obama and the peak of the American Recovery and Reinvestment Act. Dependency on federal funds varies a great deal. New Mexico tops at 30.8 percent, with Kentucky a close second at 30 percent and Mississippi a smidge behind them (29.6). The top-five is completed by Arkansas (28.7) and Vermont (28.6). At the bottom we find Virginia (14.6), Kansas (14.7) and Nebraska (15.1). Taxes pay for 47 percent of total state and local government revenue. 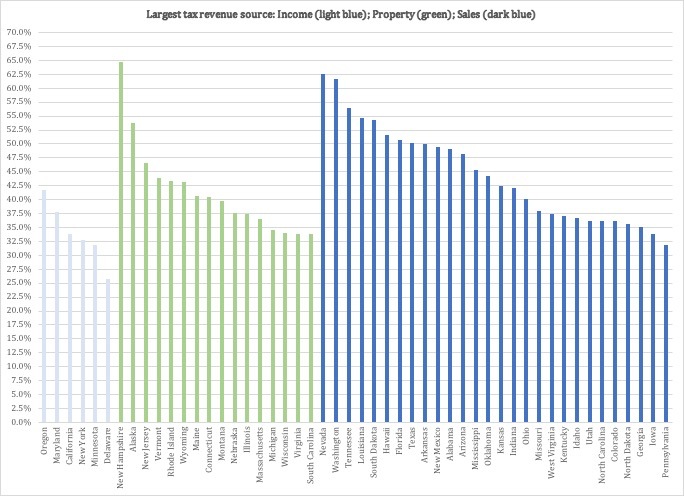 Here, again, the share varies, with Connecticut relying the heaviest on taxes (61.7 percent), followed by New Jersey (58.0), Maryland (56.6), Illinois (56.1) and Maine (54.5). Alaska has the lowest dependency on taxes for its total revenue (24.3) followed by Alabama (33.9) and New Mexico (34.7). The sales tax is the most important tax revenue source in 28 states, while property taxes dominate in 16 states. Only six states rely primarily on the personal income tax. Corporate income taxes do not contribute very much for state and local governments. The highest tax revenue share is in New Hampshire at 10.9 percent, followed by Alaska at 7.5 percent. Virginia: taxes 48.7 percent, current charges 18.9 percent and federal funds 14.6 percent. The balance between tax revenue and federal funds will shift to the disadvantage of taxes when we look specifically at the states.